Uganda’s president signed a major anti-gay law yesterday, which imposes penalties up to life imprisonment for homosexual activity and harsh penalties for establishing gay organizations an for those who do not report gay people, thus making it impossible to live an open life. The new law highlights the need for Catholics, including Pope Francis and bishops around the globe to speak out against the rise of anti-LGBT legislation. 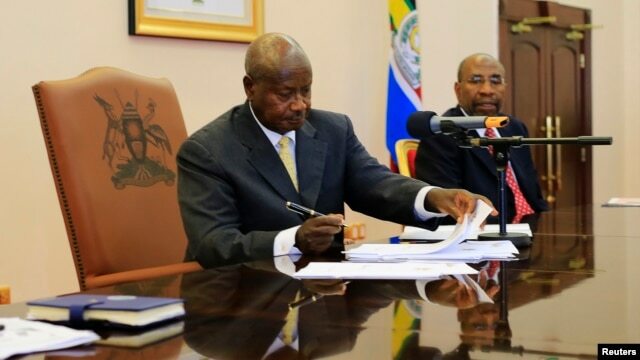 This new law comes after repeated delays by Ugandan President Yoweri Museveni to sign the bill, which LGBT advocates hoped was a sign he would reject it. Opposition against an anti-gay law in Uganda has been ongoing for several years. It has been one of the more prominent debates internationally due to provisions in an earlier version imposing the death penalty for homosexuality, causing many to dub it the “Kill the Gays” bill. Since 2009, Catholics have joined these protests given that more than 40% of Ugandans are members of the Church. Frank Mugisha, a gay Catholic man, and others have led efforts internally to stop Uganda’s passage of the law. Catholics worldwide have raised their voices as well by signing letters of concern with other Christians and urged Catholic leaders to do the same. Equally Blessed, a U.S. coalition of four Catholic organizations (Call To Action, DignityUSA, Fortunate Families, New Ways Ministry) issued 2012 statement urging US bishops to speak out. Former US ambassador to the Holy See Thomas Melady called on religious leaders to condemn such laws, and a letter to Uganda’s papal nuncio from Brother Brian McLauchlin, a New Ways Ministry volunteer, received a positive reply that the nuncio would be working to halt any anti-gay law alongside Uganda’s bishops. Most notably, South Africa’s leading Catholic newspaper, the Southern Cross, wrote a strongly worded editorial about the need to stop anti-LGBT laws as part of the Church’s larger defense of human rights. Yet, unfortunately, Uganda’s bishops and the Vatican failed to defend the human rights of gay people. The national bishops conference reversed its subdued opposition to the anti-gay law and joined a vocal ecumenical effort to criminalize homosexuality. Despite repeated calls for action, including the ongoing #PopeSpeakOut campaign by people of faith, Pope Francis and other Church leaders have not come out publicly against these types of laws which are on the rise. Nations such as Russia and India have imposed new restrictions on gay people, while 38 of 54 African countries ban homosexuality. Uganda’s passage of this new law is a troubling sign, and adds to the anti-LGBT movement whose laws breed a culture saturated with discrimination and violence targeting gay, lesbian, bisexual, and transgender people. Pope Francis has captured global attention by refocusing the Catholic Church on issues of social justice, and he must now use his moral authority to protect the lives and well-being of every person. Now is the moment to raise your voice as well. Will you send him a tweet or write a letter as part of #PopeSpeakOut? Find more information by clicking here. The Vatican and the Ugandan Bishops must speak out against these laws. They must. Otherwise, how can anyone stay Catholic? People are suffering, and these laws may lead to the death of innocents. How can Catholics stand by? And words are not enough. We must get the laws repealed, and start living as Christ taught. Catholicism and these laws should not be compatible in any way, shape or form. There is no “we agree to disagree” in this case. This is the moment of truth for the Vatican and the Catholic church.